Taking a generation of us who...were socialized in the '80s...at a moment when materialism was at its height, and challenging us to choose a profession that has delayed gratification in terms of a financial payout...I think that was a remarkable thing to do. The Andrew W. Mellon Foundation was established as a nonprofit philanthropic organization in June 1969 with a mission to “aid and promote such religious, charitable, scientific, literary, and educational purposes as may be in the furtherance of the public welfare or tend to promote the well-doing or well-being of mankind.” In 1988, under this broad charter, the Foundation made a long-term commitment to help remedy the serious shortage of faculty of color in higher education through the Mellon Minority Undergraduate Fellowship (MMUF) program, as it was then known. Henry Drewry, program associate at the Mellon Foundation and co-founder of MMUF with then-president of Mellon William G. Bowen, was MMUF's first director. 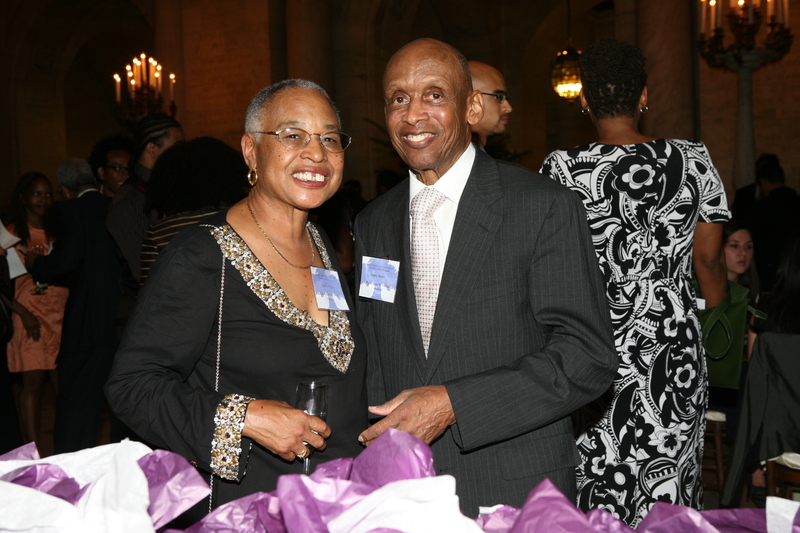 Former MMUF Directors Lydia English and Henry Drewry at MMUF's 20th anniversary gala in 2008. MMUF began in 1988 with eight participating institutions: Bryn Mawr College, Carleton College, Cornell University, Hunter College, Oberlin College, Swarthmore College, the University of Chicago, and the University of Pennsylvania. The following year, eleven more schools joined the program: Brooklyn College, Dartmouth College, Harvard University, Princeton University, Queens College, Stanford University, the UNCF consortium of historically black colleges and universities, Wellesley College, Wesleyan University, Williams College, and Yale University. Henry Drewry retired as program director in 1992 and was succeeded by Jacqueline Looney, formerly of Duke University. During Dr. Looney's tenure, a total of ten new institutions joined the program: Bowdoin College, Brown University, City College of New York, Rice University, the University of Southern California, and Washington University in St. Louis, all in 1992; and Barnard College, California Institute of Technology, Columbia University, and Duke University, all in 1996. Dr. Looney was succeeded as director in 1999 by Lydia English, formerly of Brown University. Dr. English brought fifteen new schools into the program: Emory University, Haverford College, Heritage University, Macalester College, Smith College, and the University of Cape Town in 2000-2001; and Connecticut College, Grinnell College, Northwestern University, the University of California at Berkeley, the University of California at Los Angeles, the University of the Witwatersrand, the University of the Western Cape, and Whittier College in 2007-2008. Dr. Armando Bengochea, MMUF's current director, formerly worked with the MMUF programs at Brown University and Connecticut College during his 27-year career as a dean. In 2003, the Foundation reaffirmed its commitment to, and broadened the mission of, MMUF. The name of the program was changed to the Mellon Mays Undergraduate Fellowship Program to symbolically connect the program's mission to the stellar educational achievements of Dr. Benjamin E. Mays. During Dr. English's tenure, the program produced its 100th PhD - and a few years later, its 200th PhD. Dr. English retired in 2009 and was succeeded by Carlotta Arthur, formerly of Smith College. Dr. Arthur had previously been program officer for the Historically Black Colleges and Universities program area at Mellon. In 2009 the Mellon Foundation combined the HBCU program area and MMUF under the umbrella of a newly formed program area, Diversity Initiatives, of which Dr. Arthur became program officer and director. During her tenure, the program’s total number of PhDs produced reached and passed 300, then 400. Dr. Arthur was succeeded as Diversity Initiatives program officer and MMUF director in 2012 by Armando Bengochea. Dr. Bengochea had previously coordinated or advised the MMUF programs at Brown University and Connecticut College. He brings 27 years' experience working as an academic dean to the directorship of MMUF and the Diversity Initiatives program area. Dr. Bengochea's tenure has thus far seen the addition of four new institutions or consortia to MMUF: the consortium of Claremont Colleges, the University of California at Riverside, the University of New Mexico, and the University of Texas at Austin, all of which entered the program in 2014. The MMUF Search Tool for Fellows on the Job Market is Live! MMUF PhDs Jericho Brown and Rowan Ricardo Phillips Are Among NYT's "Black Male Writers of Our Time"
© 2019 THE ANDREW W. MELLON FOUNDATION. All rights reserved.